And we're back! With the sixth Books I Want to Buy and Why, and a bit of a different one today. It wasn't until I finished the post that I realised five out of the eight books are the first in a series. Normally I spread them out but I have a love for series and I just want to read all of them it seems! 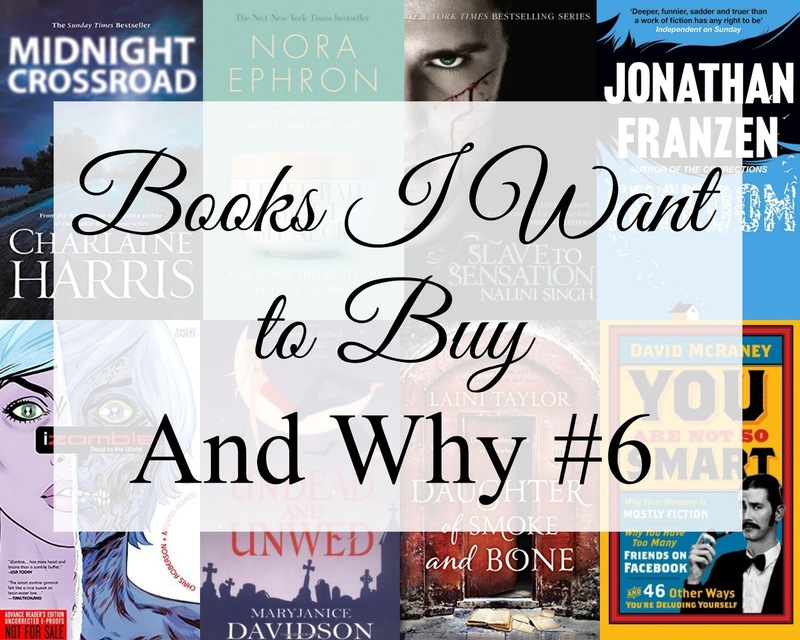 You can see the rest of the Books I Want to Buy and Why series here! But anyway, what made it on today's list? There are few writers who I aim to systematically read all of their work; Enid Blyton, Jeffery Deaver, and Charlaine Harris. Midnight Crossing is the first book in her new series, set in a small town in Texas where nothing is as it seems. Colour me intrigued. I've mentioned Nora Ephron before in the first Books I Want to Buy and Why when I talked about her fictional book, Heartburn. Well, this is her self-deprecating book about things she had learnt as she aged. Considering some of my favourite life lessons come from her movie; You've Got Mail, I'm hoping I'll learn from this too. I won the 9th book in this series from Gollancz on twitter a couple months ago and was debating if I should really start a new series just because I owned the 9th book. I downloaded a sample from iBooks and everything. Then I happened to mention this to my brother, it turns out that my sister-in-law is a big fan of the series and the writer, and I trust her opinion. So Slave to Sensation, the first book, joined the list. I could probably write an entire blog post on books I bought because they were mentioned in a TV show. Actually... I might. Anyway this was mentioned in Parks and Recreation Season 3, Episode 13 so I clearly need it if Leslie Knope likes it. Apart from that, I know nothing about it. "-the book Freedom by Jonathan Franzen." "Why am I reading this?" "Because I'm almost done with it, Ann. And I want to talk to you about Patty!" Everyone in the world has read this series, or at least it feels like it. At least 10 of my Goodreads friends and most of the Booktubers I watch. I have no idea what it's about but I'm willing to read anything that so many people love! So I marathoned season 1 of iZombie in about two days. It's really good, corny, fun and I'm all for reading the original comics when you like the TV adaptation. I read that it's slightly different than the show too, which makes me all the more curious about what was changed. I went on one of those websites that recommend books from a book you enjoyed and put in Dead Until Dark by Charlaine Harris. This is what was recommended, so I read the synopsis and added it to my list! A new vampire, who doesn't care for vampire politics and just wants to live- so to speak. Sounds like my kind of book. I found this on a googling binge for books to make me smarter, and by gosh if that title didn't just reel me in. I'm pretty sure that I'm deluding myself in a lot of ways, and I want to know what they are! Even if I never really had that many friends on Facebook (wah), I'm interested to see what this book has inside. Have you read any of these books? What do you think of my picks? 5 Things I Love about a New Year! Books I Took to Germany! 5 Things to do when Christmas is Over! Books I Read in November! 5 Things to do for Charity this Christmas! Christmas Movies with Emma Hannigan!